yesterday we heard a record of Dee Dee Bridgewater produced by Stanley Clarke performing a song of Elton John from his abum “Blue Moves” 1976. Today I want to show you another song from this album which shows us Elton John in a way that you never saw and heard before. A virtuous piano player performing with the London Symphpny Orchestra. I heard the song first time in “Kleines Café” in the Inner City of Vienna in summer 1975, when my first big love of my life, a beautiful Eurasian girl named Elma Choung, left me. I just was 17 years old and when Elton John started to sing I coudn´t refuse to start crying and couldn´t stop until the end of the song. From this moment Elton John´s “Tonight” accompanied me through many adventures and experiences of my life, and I found out time after time that the track is a real effective can opener, but this would be another story. Please listen to the very touching lyrics written by Elton John´s long-term lover Bernie Taupin. Here´s Elton John in the film “Tommy”. Tommy is a 1975 British rock musical fantasy drama film based upon The Who‘s 1969 rock opera album Tommy about a seemingly disabled boy who becomes a religious pinball champion. Directed by Ken Russell, the film featured a star-studded ensemble cast, including the band members themselves (most notably, lead singer Roger Daltrey, who plays the title role), Ann-Margret, Oliver Reed, Eric Clapton, Tina Turner, Elton John, and Jack Nicholson. And here´s Roger Daltrey in a very rare video from the film “Lisztomania”.1975. 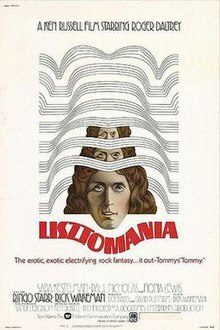 Lisztomania is a 1975 film by Ken Russell about the nineteenth century composer Franz Liszt. The screenplay is derived, in part, from a “kiss-and-tell” book, Nélida by Marie d’Agoult (1848), about her affair with Liszt. Depicting the flamboyant Liszt as the first classical pop star, Lisztomania features contemporary rock star Roger Daltrey (of The Who) as Franz Liszt. The film was released the same year as Tommy, which also starred Daltrey and was directed by Russell. Rick Wakeman, from the progressive rock band Yes, composed the Lisztomaniasoundtrack, which included synthesiser arrangements of works by Liszt and Wagner. He also appears in the film as the Nordic god of thunder, Thor. Daltrey and Russell wrote the lyrics for the soundtrack, and Daltrey provided vocals. Of the other rock celebrities appearing in the film, Ringo Starr, drummer of The Beatles, appears as the Pope. Please view this very rare video basing on Franz Liszt´s “Love Dream” arranged by keyboard legend Rick Wakeman. By the way from my experience this track is as well a very effective can opener which can succesfully be used until present time. in the cult film “Tommy”. I wish you a very beautiful Thursday and may you feel free today! See me, feel me, listening to you. It´s the final scene of this cult movie. Happy Thursday. Tommorow I´ll be back with a new story!